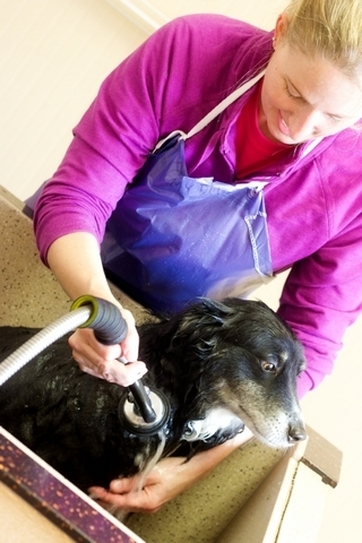 That's right, we'll wash your dog for you. This service is available Monday through Friday during normal business hours and by appointment only. We schedule appointments on the hour, starting at 11:00 am, then from 1:00 pm through 5:00 pm. Special rates apply to this service, so please see below for what we have to offer and the rates that apply to each of them. Bring your dog to The Scrub at least 5 minutes prior to your scheduled time. Discuss the particulars about the services required with The Scrub associate performing the service. Wait in our reception area or visit nearby shops while your requested services are performed. 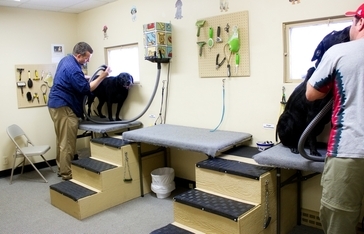 We Scrub 'em rates are determined by each dog's approximate weight and includes shampoo of your choice.